I had this image kicking around on my computer for quite a while and today I came across it again. It is just an overhead shot through a skylight (I was experimenting taking the same shots of harsh lighting contrasts with and without a flash). When one looks more closely, the image changes – suddenly one sees an ottoman, made out of beige and blue suede, sitting on a black floor. Why and how that happens one can read up on here: Figure-Ground (perception). So I managed to create an optical illusion. That’s another first in my life. When I first saw it, I thought it was a white, solid geometrical object, like a pill at very high magnification. 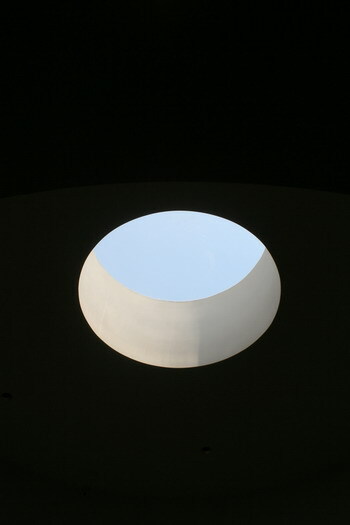 When you revealed that it was a skylight, I went back and looked, and I could see that. That’s a great photo. With your permission, I may put it on TFG, as a “what is this” and see if anyone can figure it out. Might be fun. What do you think? Yes, Karen, feel free to to that. It will indeed be fun to see whether anyone can figure it out. Everything depends so much on perspective and perception – if you look at the blue area first, you get an object. Once you look at the black area (especially the lower part), you get the skylight. Lesson learned: Things are not always what they seem to be.